Virginia Wesleyan recently completed a comprehensive campus master planning process addressing how to best meet the University's academic mission, future campus needs, and commitment to sustainability through the ongoing evolution of its physical space. The 10-year Campus Master Plan responds to a set of specific questions, challenges, and opportunities facing the University as we plan for the future. 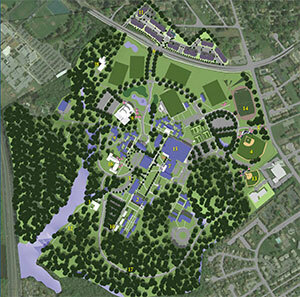 Areas of inquiry not only focus on the inevitable long-term expansion of facilities and capital projects, but also address Virginia Wesleyan's commitment to sustainability and responsible land use. To support current capital projects, please contact advancement@vwu.edu.